Generating leads and sales in e-commerce is a tough game. Every day, you get traffic and 98% of that traffic never converts into a lead or sale. So what is the best way to convert more of that traffic? The key lies in engaging shoppers while they are on your site and providing value in different ways. Top performing e-commerce brands engage their traffic with pop-ups and close sales. I spend a lot of time researching how brands use promotions to drive sales. Recently took a look at these six retailers to see how they use promotional pop-ups on Shopify to generate leads and sales from everyday traffic. These are simple tactics that any retailer can implement today. Email still remains the top marketing channel for driving sales with 3X the conversion rate of social channels. It’s imperative for e-commerce retailers to continuously build their email list and one of the simplest ways to accomplish this is with a contest. The best part about a contest promotion is that any retailer can use it to build their list. Use a product or bundle of products that your target market would have an interest in receiving. Use a pop-up to maximize the exposure of your contest promotion. 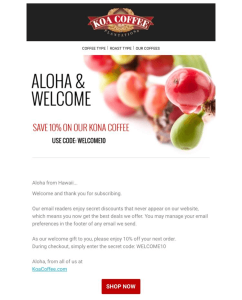 This offer is attractive to shoppers and they are much more inclined to enter to subscribe to your newsletter with an item of value available. engages shoppers with a pop-up contest promotion. Visitors can easily enter their email for a chance to win an enticing bundle of gear. This simple tactic generates an average of 500 new email subscribers every day and has enabled the watch retailer to rapidly expand their reach. E-commerce is a promotion driven business. There’s a ton of competition and savvy consumers will go to extensive lengths to find the best deal. So what do retailers do? They use sales promotions to drive shoppers to purchase. Instead of just giving away promo codes for nothing, get something in the process. Use these small, everyday discounts to sway shoppers to purchase today and also acquire an email subscriber or social fan. 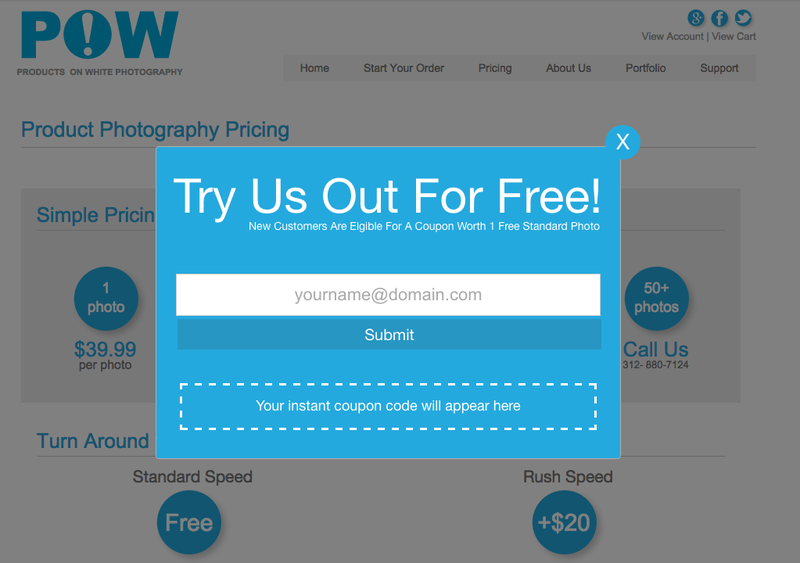 There are three reasons why this is more effective than displaying promo codes openly on your site or on third-party coupon sites. First, by requiring shoppers to perform an action in order to receive the promo code, you create exclusivity and therefore a need. People want what they can’t immediately have. Second, Displaying your promotion with a pop-up overlay places your message in prime real estate on your site. This maximizes its exposure and visitors will not overlook your offering. By simply engaging shoppers, you’ll increase interaction with your offer and convert more visitors. Lastly, you can prevent visitors from leaving your site for a variety of reasons. On-site promotional offers eliminate visitors from bouncing to compare prices or coupon hunt because you’re offering them what they would normally leave to look for. 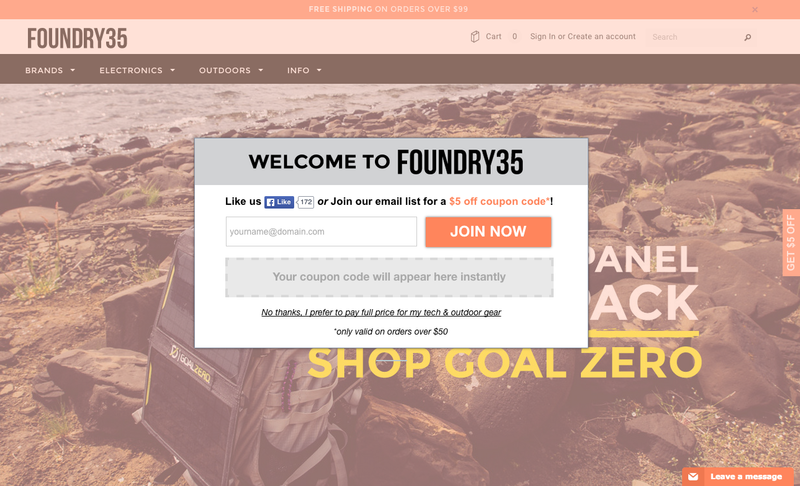 Foundry35, a retailer of quality electronic and outdoor products, engages their shoppers with this well-crafted pop-up in which shoppers can receive $5 off by subscribing or liking the company on Facebook. 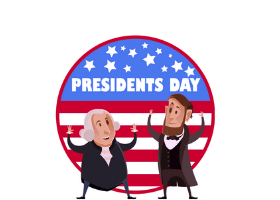 They have influenced a purchasing decision with a promo code while also opening a channel for future marketing opportunities. Sometimes shoppers will completely overlook important information that is displayed on site. If you want your visitors to actually see something then use a website pop-up. As mentioned before, this gives your message increased visibility and your message will no longer be overlooked. This is also a great opportunity to display your brand and potentially drive engagement. 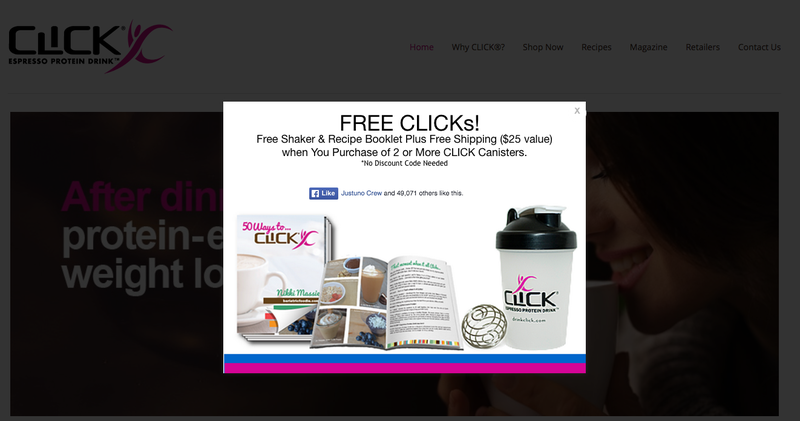 Click, the tasty espresso protein drink brand uses an informational pop-up to notify shoppers how they can receive a bunch of free gear along with free shipping. The thing I like most about this message is the use of a free recipe booklet. This adds value to the brand experience and helps with brand loyalty. Using content is a great way to provide further benefit aside from your products. It’s difficult to get new customers and in e-commerce, it can end up taking some time. However, if you can get people to use your product or service early on, the decision process occurs much faster. By offering a free sample you can accelerate new customer acquisition. Products On White Photography is a service that takes high-quality product photos for retailers to use on their own e-commerce sites. 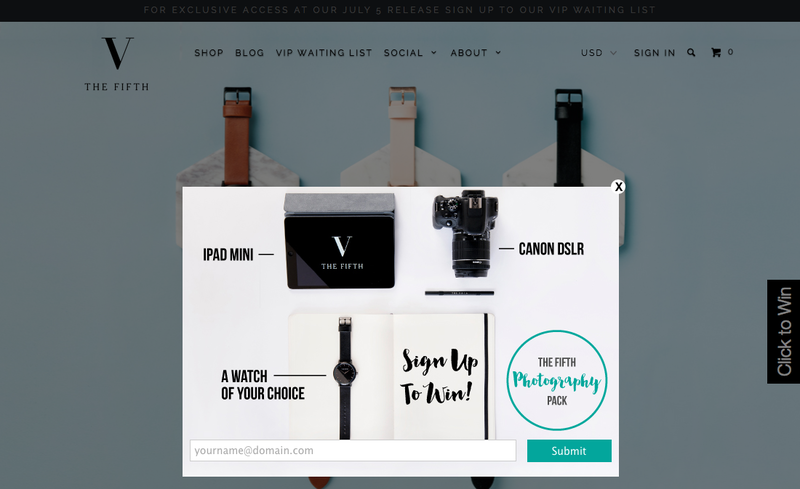 To show the value of their service, they present a pop-up promotion offering new customers one free standard product photo. 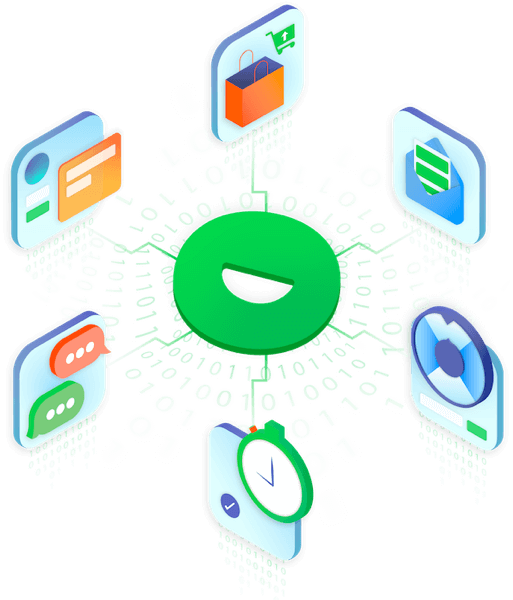 Now, the barriers to using their service are completely eliminated and they now have the opportunity to gain a paying customer. 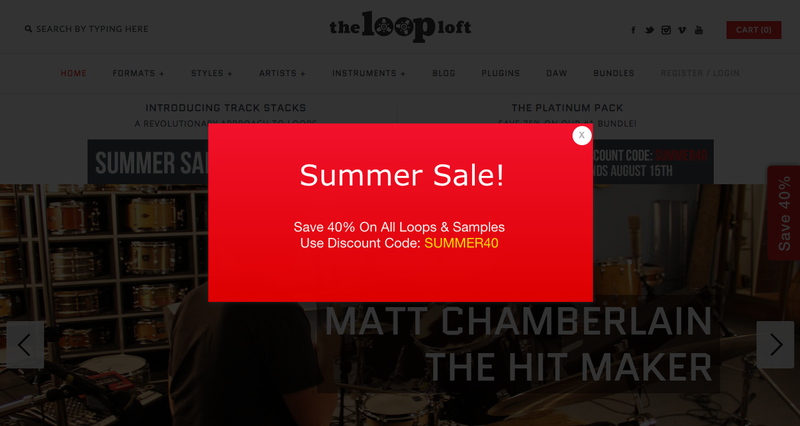 The Loop Loft sells loops of a wide variety of instruments for high-quality music production. As a way to temporarily increase sales, they are currently running a 40% off sale. 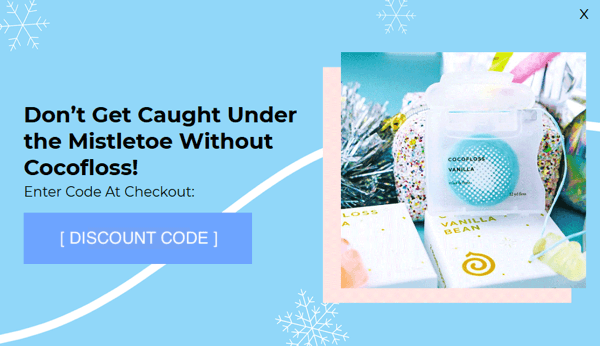 Presenting this simple pop-up overlay gives shoppers a reason to purchase on their current site visit. The biggest contributor to lost revenue is cart abandonment. On average, 68% of carts are abandoned and for a variety of reasons, mainly price and total cost. When a shopper is on the cart page or in the process of checking out, he/she is so close to completing a purchase so retailers must have something in place to convince them to buy. 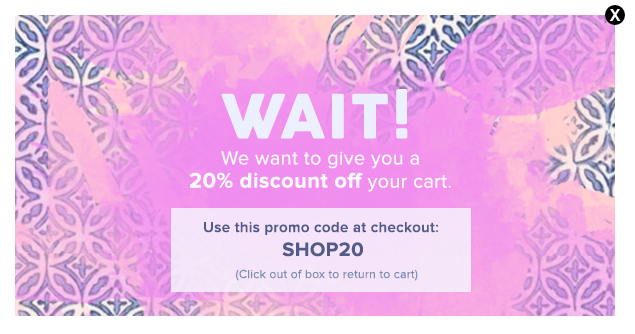 Love on a Hanger displays this attractive offer to shoppers who attempt to leave the cart page. By increasing the discount amount and just giving the promo code to the shopper, Love on a Hanger provides an easy way for shoppers to get the deal they want which, more times than not, results in a completed purchase. Promotions are a big part of sales in e-commerce and you must get the most benefit out of each promotion you run. Pop-ups allow you to increase visibility, generate engagement, and drive sales. It’s time to proactively drive conversions on your website. To implement pop-up promotions on your site, get started with a free 14-day trial or download the app on Shopify!